Displacement is a measure of length due to motion in one or more directions resolved in dimensions of meters or feet. It can be diagrammed with the use of vectors positioned on a grid that indicate direction and magnitude. When the magnitude is not given, the properties of vectors can be exploited to calculate this quantity when the grid spacing is sufficiently defined. The vector property that is used for this particular task is the Pythagorean relationship between the lengths of the vector's constituent components and its total magnitude. Draw a diagram of the displacement that includes a grid with labeled axes and the displacement vector. If the motion is in two directions, label the vertical dimension as "y" and the horizontal dimension as "x." Draw your vector by first counting the number of spaces displaced in each dimension, marking the point at the appropriate (x,y) position, and drawing a straight line from the origin of your grid (0,0) to that point. 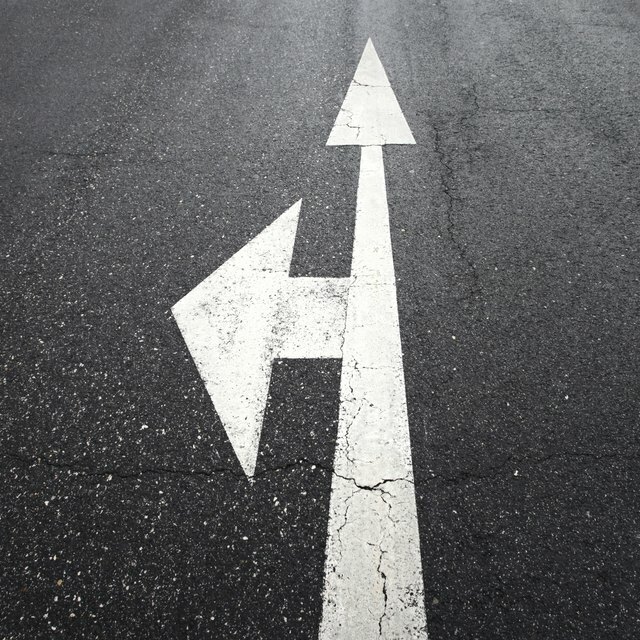 Draw your line as an arrow indicating the overall direction of the motion. If your displacement requires more than one vector to indicate intermediate changes in direction, draw the second vector with its tail beginning at the head of the previous vector. Resolve the vector into its components. So, if the vector is pointed at the (4, 3) position on the grid, write out the components as V = 4x-hat + 3y-hat. The "x-hat" and "y-hat" indicators quantify the direction of displacement via the directional unit vectors. Remember that when the unit vectors are squared, they turn into a scaler of one, effectively removing any directional indicators from the equation. Take the square of each vector component. For the example in Step 2, we would have V^2 = (4)^2(x-hat)^2 + (3)^2(y-hat)^2. If you are working with multiple vectors, add the respective components (x-hat with x-hat and y-hat with y-hat) of each vector together to get the resultant vector before doing this step on that quantity. Add together the squares of the vector components. From where we left off in our example in Step 3, we have V^2 = (4)^2(x-hat)^2 + (3)^2(y-hat)^2 = 16(1) + 9(1) = 25. Take the square root of the absolute value of the result from Step 4. For our example, we get sqrt(V^2) = |V| = sqrt(|25|) = 5. This is the value that tells us that when we have moved a total of 4 units in the x direction and 3 units in the y direction in a single straight line, we have moved a total of 5 units. Small, Andi. "How to Calculate the Total Magnitude of Displacement." Sciencing, https://sciencing.com/calculate-total-magnitude-displacement-7325590.html. 13 March 2018.